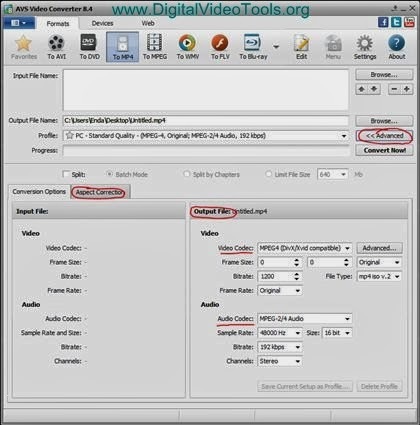 Step 3: Add the required AVI file (click icon in the top left corner) or the “Browse” button into AVS Video Converter as shown below in the diagram. Note: In this tutorial the input file (AVI) name is called “FileName”. Step 4: Select the output format by clicking the large rectangular “To MP4” thumbnail that is located along the top of the software interface. Step 5: Select Output File Name by clicking on the “Browse” button on the right hand side of the screen. Manually type a suitable file name for the output file. This is shown in the diagram below. Note: In this tutorial I have called the output file (MP4) “NewMP4”. Step 6: In the “Profile” section, select the most appropriate output setting for your video file. This may be a good time to consider what device your new MP4 file will be most played on. I have selected “PC – Standard Quality” for mine as I will be watching my output video on my PC. Note: AVSVideo Converter has created a very comprehensive list of profile outputs that are suited to a variety of different video playback devices e.g. tablets, mobile phones and video consoles. Be sure to experiment with different output profiles to find one best suited to your needs. Step 7 (Optional): You may need to configure the “Advanced” settings for your specific application. The properties of your outputs MP4 can be changed here e.g. video codec, audio codec and aspect ratio may be changed here. In my example I left everything as default. Shown in diagram 4 below is the Advanced Settings Panel. You now may convert your video from AVI to MP4. The length of time this takes depends on the file size and selected bit rate. You can monitor your conversion progress via the progress bar at the bottom of the software interface. A 30MB AVI file should only take a few minutes to convert. You may need to pause your conversion during the process. You can monitor your conversion progress via the progress bar at the bottom of the software interface. A 30MB AVI file should only take a few minutes to convert. You may need to pause during the conversion. You can do this using the “Pause” button. You can also choose what the software does when the conversion finishes e.g. play a sound or just do nothing. What I found very useful was the option to have the software shut down my computer when the conversion finishes. You may need to run several AVI to MP4 conversions simultaneously. To do this just keep adding files like you added the first one. Don’t worry about the order you add them if you want to prioritise the order at which the conversions run. You can do this afterwards using the up/down arrows at the right hand side of the software interface. Thank you for reading my tutorial. Read my review of AVS Video Converter here to get the whole picture of this software.